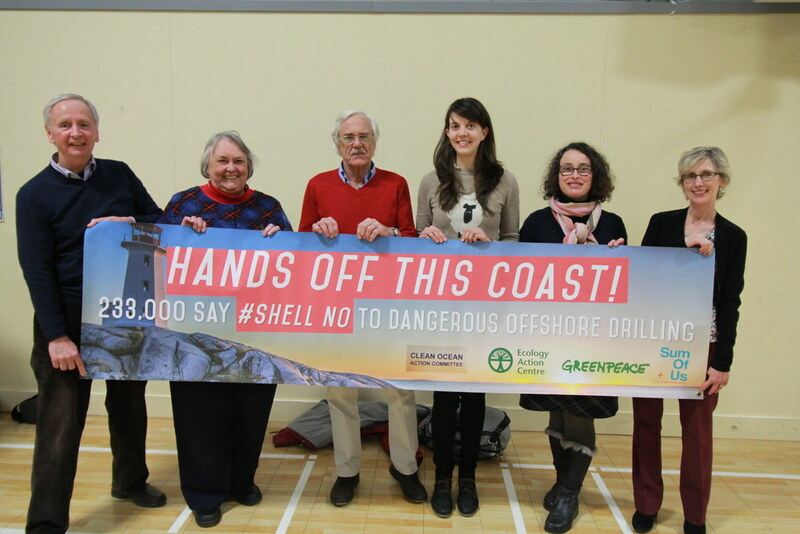 Around 130 people attended a session held Sunday afternoon by the Campaign to Protect Offshore Nova Scotia (CPONS) and the South Shore chapter of the Council of Canadians, called “Do Oil and Water Mix: A strategy session to protect our offshore?”. Organizations, community leaders and people in positions of power came to mingle (there were booths set up by allied organizations like the Sierra Club, the Ecology Action Centre, etc. ), to hear from an excellent panel of speakers, and to participate in a discussion about what we can contribute to this movement. Dr. Michael Bradfield, retired economist and Dalhousie university professor – he spoke to the externalities of the industry, how new jobs in oil and gas do not outweigh the importance of fishery and other jobs, and that industry statistics are flawed or highly inflated. Lisa Mitchell, Executive Director of East Coast Environmental Law – she spoke about environmental assessment process and the need for government to dramatically update it, and how regulatory boards have been historically favourable to industry. Gretchen Fitzgerald, National program director with Sierra Club Canada Foundation – she drew connection with the fight to protect the Gulf of St. Lawrence from oil and gas and shared lessons learned from this and other organizing experiences. John Davis, Founder and Director or the Clean Ocean Action Coalition (COAC) and fishermen in Shelburne – John shared what COAC’s campaign focused on, predominantly calling on the Canada-Nova Scotia Offshore Petroleum Board to place moratorium on areas 3 and 4, as well as what is currently known about the Shell lease and their application to the board. This event was organized to create an opportunity for community conversation for a few reasons: 1. to bring more awareness to the issue and campaign, 2. to gain more community consensus in the desire to improve the regulatory process with an eye to stopping offshore oil and gas development, and 3. identify the skills and power that exists already in the community. Lots of great ideas were raised and people stepped up to volunteer to help out using their skills and positions, including creating podcasts, engaging fishermen, and lobbying politicians. Concerns have been raised for years with decisions made by the Canada-Nova Scotia Offshore Petroleum Board (C-NSOPB) as well as the Canada-Newfoundland and Labrador Offshore Petroleum Board (C-NLOPB), given their mandate as compared to their approval of industrial projects, which is near 100%. The CPONS is calling for a moratorium on offshore drilling until a full reform of the C-NSOPB has been completed and shows it is safe. To read more on our work to support the Campaign to Protect Offshore Nova Scotia, click here. To read more about the event through twitter, use #NoOffshore or #NoDrilling, or check out @angiles or @RobinTress.